Danielle over at The Teacup Chronicles is our hostess for February’s blog party with the delightful topic of Gems from the Herbal Library. She’ll be posting the links for all the entries tomorrow so do wander on over there to see what books others have been inspired by this month. Sometimes, reading reams of research material and the like can begin to sap the joy from our herbal learning and it’s easy to forget the simple pleasures of gazing on a wild plant or a herb in our gardens. It’s not always possible to get outside and sit amongst our green friends however, especially at this time of year, which is why I decided to share with you some of my favourite illustrated herbals. I’ve always been a visual person and I can never get a real sense of a new or exotic herb until I have seen it with my own eyes, no matter how much knowledge I may have gleaned on it’s usage. 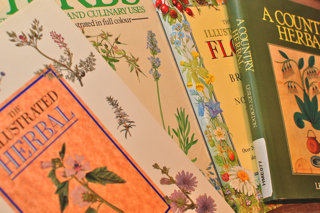 So without further ado here are some of my favourite herbal picture books, I hope you also get some pleasure from gazing on their beauty. 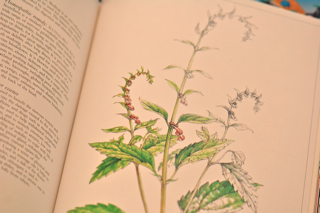 The Illustrated Book of Herbs, edited by Sarah Bunney, is full of delightful drawings alongside small entries on the botanical descriptions and traditional uses of each plant. The Illustrated Herbal by Philippa Beck is a similar, though smaller, volume covering fewer plants but including some interesting recipes for medicinal and cosmetic use. 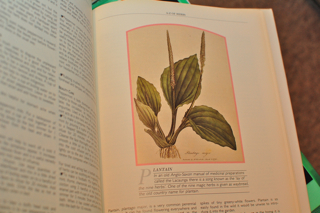 I particularly love this illustration of plantain. A wild flower guide rather than a herb book, The Illustrated Flora of Britain and Northern Europe, by Marjorie Blamey and Christopher Grey-Wilson is still most definitely a gem of my herbal library, one of those things that you find in a second hand book shop and treasure ever more. Each page is filled with illustrations and I’ve found it a useful reference guide as well as a thing of great beauty. 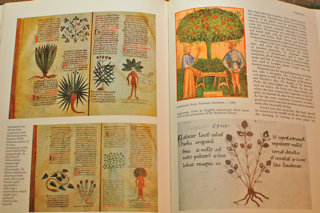 A Country Herbal by Leslie Gordon, contains some great images like these Medieval depictions of mandrake and marjoram and some interesting tidbits on traditional plant uses, though it’s fairly light on useful medicinal information. Slightly more modern, these three also make delightful additions to my picture-book collection. Herbal by Deni Brown, was a Christmas present this year and I love the mix of beautiful photos and botanical illustrations in this lovely purple cloth bound book. There’s not much in it that would be new for the experienced herbalist but it’s still a delight to own, just look at this wonderful illustration of dandelion. 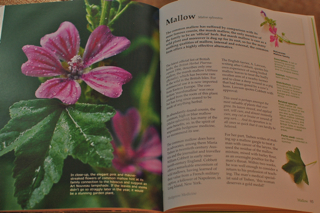 I love all the bright and vibrant photos in Hedgerow Medicine by Matthew and Julie Bruton Seal and I’ve picked up some great tips from it’s simple and easy to read style and lovely recipes. This is a perfect book for beginners interested in picking and making their own remedies from the wild but it’s still enjoyable for more experienced herbalists too. Last but not least is The Complete Floral Healer by Anne McIntyre which is full of the botany, folklore and medicinal properties of a whole host of well known flowers. It’s also bright and beautiful with photos or illustrations for each entry. Check out this lovely skullcap drawing. I hope you enjoyed looking at this little selection of my favourite illustrated herbals and do let me know if you can recommend any others! Oh, what beautiful books you have! 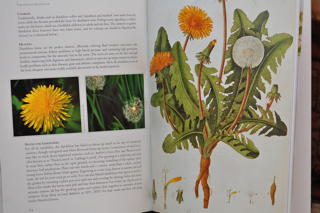 The dandelion in ‘Herbal’ is such a beautiful drawing it makes me longing for my pencil and start to draw again! 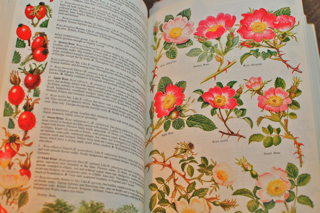 The page you made a photo of (The Illustrated Flora of Britain and Northern Europe) is soooo awesome! There is so much love and heart in the illustrated details. Thanks a lot for your lovely post! What a great blog party adventure!!!!! I know what you mean, I so enjoy these blog parties and getting inspiration from everyone else’s ideas. As they say in Thailand we are all ‘same same but different’! I do hope you decide to pick up your pencils. I’d love to see some of your drawings! Hi Lucinda…….the books are beautifully illustrated. Wonderful pieces of individual artwork. 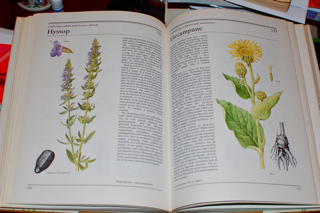 I have many herbal books and never tire of spending an evening looking through them. I grow many wildflowers (weeds to others) in my gardens. They draw in the insects, and for me, add a charm to the garden. Thank you for sharing your lovely herbal library with us…….. I should love to hear about some of your books, perhaps when you are blogging again you could share some of them? I’ve just ordered some wildflower seed from Suffolk Herbs, harebell, Jacobs ladder, honesty and meadow cranesbill among them. Your garden truly sounds like paradise will the wildflowers, woods and beautiful medieval plants… I do so hope you start your nursery this summer!! I think they did a version of Hedgerow Medicine for the US market called Backyard Medicine or Backyard Remedies, one or other. We are so lucky to have such a wealth of flora and fauna in the hedgerows here, just today I went out to visit my Elder friend and was thinking about how many of my medicines come from the hedges. Thanks for hosting the blog party, I think everyone has especially enjoyed this theme! OOOOhhh I am going to have to keep an eye out for some of those books! I already have the Anne McIntyre book – she’s a wonderful writer, and her book ‘the complete woman’s herbal’ is wonderful as well! 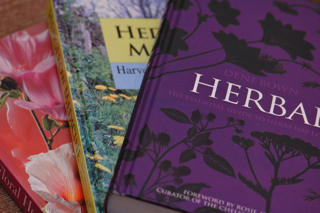 Hedgerow medicine is one of my favourites as well – I find it so inspiring to browse through! The Lesley Gordon herbal was one of the first herb books I bought back when I first got interested in plant medicine – right after Culpeper’s herbal, of course! I haven’t come across that Deni Bown book though, so I just might have to add that to my amazon wish list… 😀 Exciting stuff, finding new books to get! Lucinda, At the end of the summer I will send you a package of organic wildflowers seeds from my gardens. That will be an absolute pleasure……. Great choices Lucinda! You and Brigitte are responsible for my herb shelves groaning under more weight lol! I love all your choices, I found Deni’s Herbal book when I visited Queen Eleanor’s Garden in Winchester several years ago, no matter where I go I manage to find something herbal to take away with me and its usually a book. My copy has a watercolour on the front of Poppies. Incidentally in my ‘part 2’ book gems blog post I mentioned William Woodville on p16 of Herbal the Yarrow illustration is by him! I totally love the way Deni marries old prints with new lush photos interspersed with information. As important as it is the info just seems second place, the beautiful images take over. I was actually going to pick Herbal as one of my choices, noticed you had so picked another instead. Totally agree with what you said about Lesley Gordon’s book, it is interesting from an historical point of view and has some lovely illustrations. I adore Hedgerow Medicine, its another book I get out when I want inspiration, the Kitchen Medicine book is just as good. The only thing missing from some of these books is the fragrance, will they ever have smelly vision books I wonder? I’ll be first in the book queue if they do! Thanks for sharing your gems, a delight as always! Have a blessed day, and look forward to reading here more often!